The vehicle is also new inside, which is a good thing because past Subarus have seemed to me (perhaps unfairly) to be a tad long in the tooth in how they felt compared with some other carmakers' offerings. Indeed, this Forester – and the Ascent I reviewed a while back – seems as modern and up to date as any vehicle in their class, and that of course is a good thing. 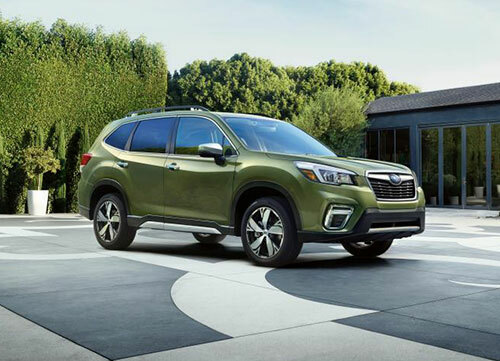 The 2019 Forester (a tree-mendous name, indeed!) is built on Subaru's new Global Platform, and its creator says it's longer, wider, more roomy inside, quieter, safer, more comfortable and better handling than ever before. That's quite a laundry list of goodness, and the Forester – fortunately – does prove that it's more than just hype. Mostly. The fledgling Forester hasn't fallen too far from its, er, tree, though: it still retains what made it nice, thanks to such Subaruisms as Symmetrical Full-Time all-wheel drive, X-MODE, SI-DRIVE and Hill Descent Control. Not all that stuff is classic Subaru (the company made its name via awd, mostly), but it's all modern and welcome. Subaru Canada's sample wore the Sport (with Eyesight) trim level, which according to their Canadian website starts at $34,995 CAD. That's near the top of the Forester line, however; you can get into a Forester for as little as $27,995 CAD, though of course you're losing content and comforts when you do that. The Sport seems like a nice compromise between the base and top line "Premier" version (the latter of which starts at $39,495). Not only does it offer pretty much all that you'd need in a modern vehicle, it adds some orange augmentation you may or may not like. I thought it looked pretty cool, though of course I'd rather have performance upgrades rather than merely cosmetic stuff. Alas, the Sport model offers no extra oomph compared to any other Forester. All of them get the same 2.5 litre four-cylinder Boxer, and the power is 185 horses @ 5,800 rpm (torque is 176 @ 4,400 rpm). This is merely adequate these days. Heck, the new Mazda CX-5, with its turbo four-cylinder engine, puts out 227/310 horses/torque (with regular fuel), though it'll also cost you a few grand more – and some other competitors' base engines also offer more power: the new Toyota RAV4, for example, puts out over 200 horses and the Honda CR-V boasts 190. Granted, we're not talking huge differences here other than with the Mazda, but if grunt is your thing, you can do better. Still, the Forester is a great vehicle to drive, and even its damn CVT tries to pretend it isn't one, with simulated shifts that are actually not too bad (though you'll never forget it's a CVT). It also has a nice and tight independent suspension and the handling is fine. We had some snow during my week with the Forester and, not surprisingly, it was a blast to take out onto the slippery roads. Aha radio), dual USB port/iPod controls, an auxiliary audio input and steering wheel-integrated controls. If you opt for the Sport trim level or above, you'll also be treated to a pair of USB ports for the rear seat passengers. All that stuff puts the Forester squarely in the mainstream. The audio system is okay – not a real rocker but not too anemic either. I did like the fact that the Subaru's rear-view camera features its own washer, which is a really, really handy feature when the roads get sloppy. The Sport Forester also features automatic, dual-zone climate control and a 10-way power adjustable driver's seat (heated, too, of course). Visibility to the world outside is very good. start alert, lane keep assist, Subaru Rear/Side Vehicle Detection (SRVD) and reverse automatic braking. I wasn't completely successful at turning off the most annoying of these, though perhaps a quick trip through the owners' manual would have helped were I the least bit literate. No manual transmission is available for the Forester, dammit, though you do get paddles (as long as you don't get the base model) to help prod the CVT into waking up. I wish the company would still offer its old upgraded turbo four engine, with a stick shift, but such isn't the case. The Sport trim level is new for 2019, and as mentioned you can go up market from there, to either the Limited or Premiere trim levels. The Limited (starting at $37,695 CAD) gets you goodies such as 18-inch machined alloy wheels, dual mode X-mode system, an eight-inch infotainment system with navigation, nine-speaker Harman Kardon audio system, side mirror reverse tilt and a premium front grille. For an extra couple of grand you can get the also-new-for 2019 Premiere level, with its addition of exclusive 18-inch machined alloy wheels, the DriverFocus Distraction Mitigation System (though it isn't true that a little arm comes out of the steering wheel hub and slaps you with a dead fish if your attention wanders), vertical LED fog lights, LED satin chrome side mirrors, a power passenger seat (which is always a nice feature) and chrome exterior door handles. Yes, most of the extra money goes to creature comforts and other niceties – but there's nothing wrong with that. And if you're on a tighter budget, the base Forester still gives you most of the same mechanical goodness (and, as with the CVT, not-so-goodness) as the top line model, for a lot less lucre.